China is all about the artificial celestial bodies at the moment. Just weeks after we learnt the country was making a fake moon, we're learning that its earth-based sun simulator is producing temperatures of 100 million degrees Celsius. 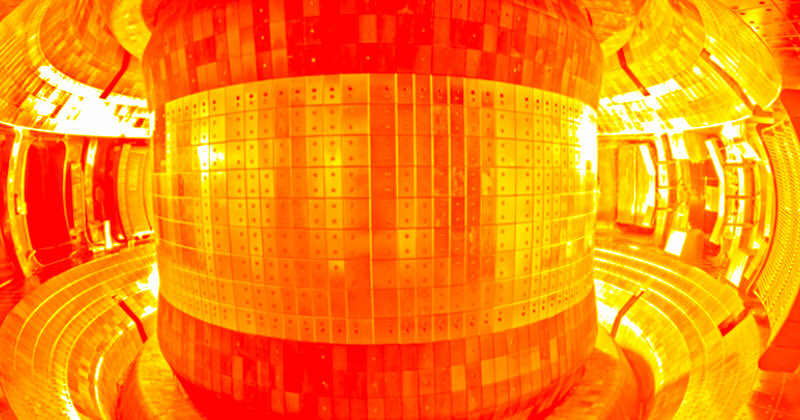 The core of the actual Sun reaches around 15 million degrees Celsius so this artificial sun is considerably hotter. But scientists believe that this is around the minimum temperature needed to create conditions suitable for nuclear fusion. At 100 million degrees celsius it's possible to force charged deuterium and tritium particles together to get them to fuse. Usually these particles repel each other, making fusion impossible without massive internal temperatures. Deuterium and tritium are isotopes of hydrogen and there's a plentiful supply available to use. One company Tokamak Energy claims that it's possible to create fusion reactors for power generation by 2030. The goal of the Experimental Advanced Superconducting Tokamak (EAST) is to understand nuclear fusion and one day use it as an alternative source of power on Earth. Nuclear fusion could create enormous amounts of power without the risk of a meltdown and with very little dangerous waste creation. Fusion relies on combining two nuclei instead of splitting an atom in the way nuclear fission reactors do. The difficulties of sustaining a reaction on Earth are considerable. EAST needs to be able to survive the massive temperatures and it needs to do so for extended periods of time to be practical for energy generation. EAST currently has the world record for sustaining a reaction in the Tokamak. Scientists achieved what's called a steady-state H-mode for 101.2 seconds back in 2017.